8,000 Acres, Over 100 Years of History, and a Bandit® Chipper. Biltmore: It’s a property steeped in history, built by one of America’s most storied families. Visiting the property on a mild late winter morning, you take in seemingly endless gardens and forests on your way to a gigantic and beautiful mansion fit for European royalty. The drive down its roads feels like it’s taking you miles into the Appalachian Mountains, and years into the past. Instead, you’re only a few miles outside of Asheville, a bustling city in western North Carolina’s mountains. Spanning more than 8,000 acres of forests and field, Biltmore is nestled in the mountains of western North Carolina near Asheville. It began as a dream of George Washington Vanderbilt III – the grandson to Cornelius Vanderbilt, the patriarch of the Vanderbilt family and railroad mogul. George Washington Vanderbilt III, who had been named after his paternal uncle, began construction on what he called his “little mountain escape,” in 1889. The young Vanderbilt commissioned famed architect Richard Morris Hunt to design the buildings that make up the estate. Hunt made a name for himself by designing private residences for other Vanderbilts, and public buildings such as the facade and the great entrance hall for the Metropolitan Museum of Art in New York City and the pedestal on which the Statue of Liberty stands. Hunt would not live to see the Biltmore House construction completed in 1896, but his mark is left prominently on the estate. He designed the main house, along with the Cathedral of All Souls, found in Biltmore Village, not far from the estate. After George Washington Vanderbilt III died in 1914, in accordance with her husband’s wishes, his widow sold a portion of the estate’s 125,000 acres to the U.S. Forest Service for use as a park. To ease the financial burden felt during the Great Depression, Cornelia Stuyvesant Vanderbilt, and her husband, John Amherst Cecil, opened Biltmore House to the public in March 1930. Family members continued to live there until 1956, when the house was opened permanently to public tours. Today, Biltmore hosts more than a million visitors each year. People come from across the globe to see the home and visit its gardens and forests. To maintain the grounds, Biltmore employs dozens of workers, including a five-man arborist crew led by Bill Hascher. He is in charge of helping maintain the grounds designed by landscape architect Frederick Law Olmsted. Among the many pieces of equipment at Hascher’s disposal is a 17” capacity Bandit Model 1590XP drum-style chipper. “It’s a lifelong project,” he said of his work. He and his crew were working to take down a diseased tree. On any given day, Hascher and his crew work to improve forest health. When it comes to trimming, Hascher’s crew chiefly concern themselves with trees that have the risk of falling in the road, or in picnic areas. Those trees are felled and then chipped using Biltmore’s Model 1590XP. In February, the 10-year-old machine had around 1,200 hours on it. “It doesn’t go out every day,” Hascher said. He added that he was beginning to think about purchasing another Bandit, but the one he has is still working great. "We’ve had very minimal issues with it,” he said. To help ensure visitor safety, each tree that is a potential hazard is tagged and its GPS coordinates are logged into a computer program. Those trees are monitored throughout their lives for signs of disease or infection. That system is like Biltmore, blending a successful past with the technology of today. “We check them constantly,” he added. Routinely, Hascher or other members of his arborist crew either walk sections of the road or drive them and survey trees. Trees that are potential hazards are dealt with before they have a chance to do any damage. Trees that won’t fit in the chipper, either because they’re too large or because they’re oddly shaped will be slabbed and turned into tables, he said. 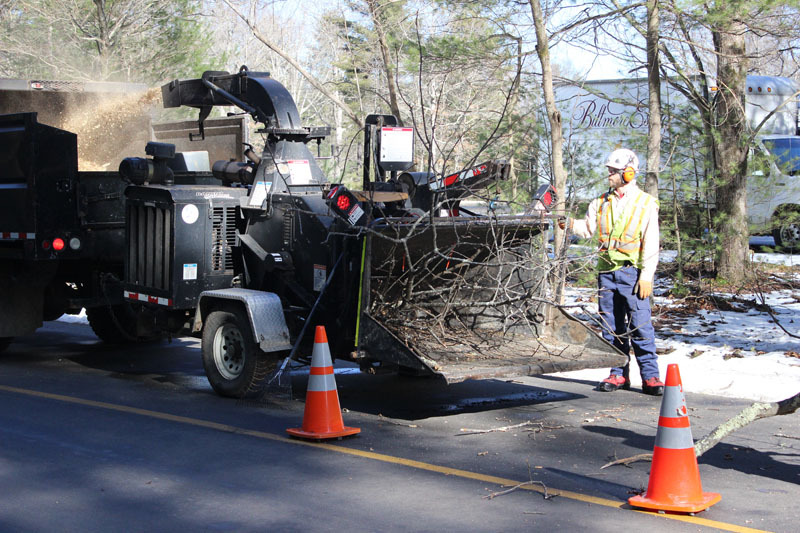 The rest – anything less than 15 inch diameter material – is run through the chipper. Those chips are either broadcast into the woods or used for chip paths throughout the gardens. The work, it seems, is never ending. And that’s fine for Bill. “There’s enough work here to stay busy for as long as you want to,” he said. Crews work four days a week – Tuesday through Friday. The five-person crew is an integral part of the horticulture department at the estate. Hascher began work at Biltmore in September 2002 when he responded to an arborist magazine’s ad. He came from Pennsylvania where he first experienced a Bandit chipper. Because of that exposure, he’d wanted to bring a Bandit to Biltmore. And he got the chance pretty quickly. Two years after he was hired, Biltmore bought its Bandit. That chipper has helped the crew through some pretty tricky times – hurricanes, storms and blizzards. And there have been a few doozies, Hascher said. They stick out in his memory – June 18, 2009; Dec. 18, 2009; and May 3, 2003. Those storms brought down plenty of trees, snarling roads and keeping Hascher’s crew busy clearing downed trees. Then there were two hurricanes in 2004 – back to back. Any storm brings challenges with it, and Hascher has come up with a good plan for dealing with the extra work brought on by the storms. “In December 2009, that was a heavy, wet snow,” Hascher said. “It was a significant amount of weight on the trees." It brought more than a foot of snow. It also brought a lot of trees down. With downed trees, roads couldn’t be plowed. 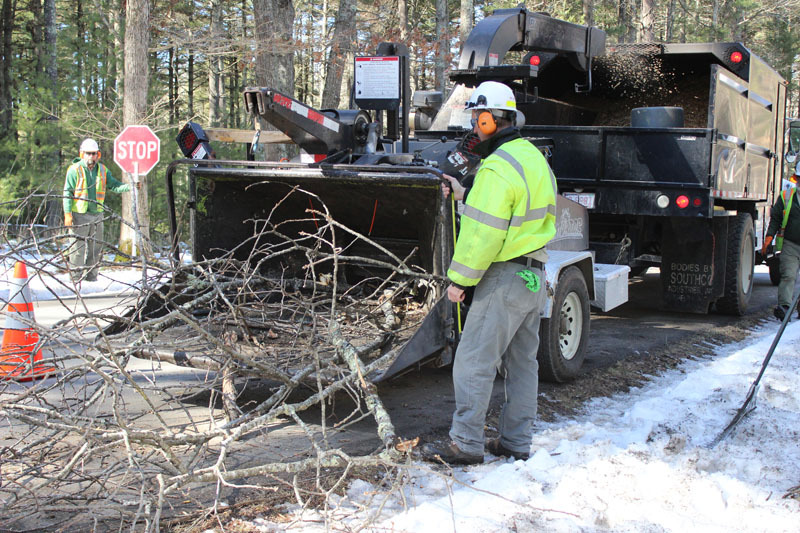 Hascher and his crew found themselves cutting fallen trees out of the roadways in order to get the roads plowed. “Snow is rare here, but it happens,” he said. In fact, when Bandit visited, there was fresh snow on the ground. It’s been working; The beautiful gardens and forests of Biltmore are lovelier than they’ve ever been. Even during the dreary winter, the forests are lush and healthy. And the guests keep on coming. That’s just fine with Bill Hascher. He’s been with Biltmore for twelve years, and he’ll be happy to stay for many more.